Artists Larry Achiampong and David Blandy’s latest film project, FF Gaiden: Delete at Bury Art Museum and Sculpture Centre, is the result of a collaboration with paperless migrants at Mennisker i Limbo (People in Limbo) in Oslo, Norway. 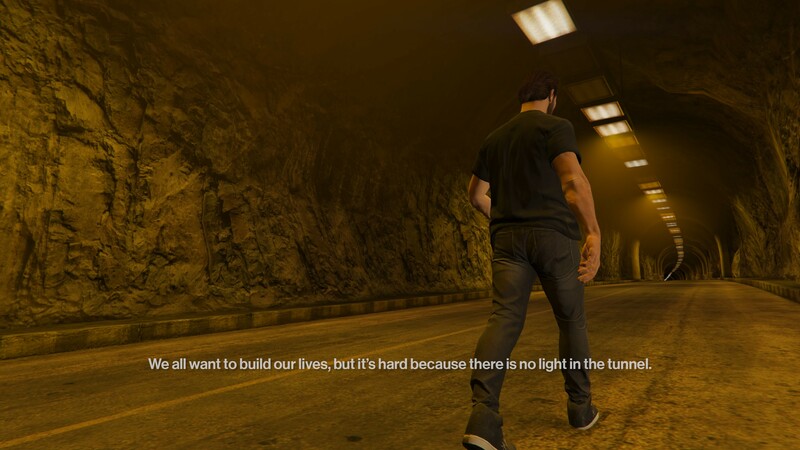 The piece subverts the medium of the computer game Grand Theft Auto V (representing perhaps the ultimate form of first world escapism) to deal with the true stories of migrants. There is an obvious tension between the medium and content here, and this is what the piece pivots upon. The purpose of the computer game is to find temporary escape, whether from boredom, the stresses of work, education, or whatever else. But when the same medium is used to tell of “the struggle, the suffering, the death” (FF Gaiden: Delete) regularly faced by migrants, it suggests that the lived reality from which we demand escapist diversion may in fact be a paradise compared with that of the paperless migrant. The film centres around the stories of two such individuals, told without any real element of drama or emotion. A CGI avatar of each migrant walks across a landscape, climbing, running, falling and climbing again, but showing no expression in either of their animated features. No names are given, only countries of origin. This is presumably partly due to necessity, but nonetheless, the lack of identity given to the two individuals adds something important to the piece; they are undocumented even as they tell their stories. A strangely-Americanised synthetic voice features throughout the film, providing a form of narration in a markedly flat tone, which itself speaks volumes. What would seem an unbelievable nightmare to many European citizens, is no more than a prosaic reality for millions of paperless migrants. There are occasional hints of emotion, yet the overall effect is more one of emphasis than dramatization. The same is true of the synth soundtrack; rather than being overtly emotive or moving, it merely floats along, carrying the viewer’s attention with it. If anything, the effect is mildly hypnotic, drawing us in to focus on the story being told. Something about the monotonous simplicity of the format becomes extremely affecting after a while. The seeming triviality and robotic nature of the narrative voice becomes outrageous, even irritating, as we start to feel the need for a more emotive expression of the stories we are hearing. Likewise, with the visuals, the CGI increasingly feels somehow wrong as the film goes on. Yet this is precisely the strength of the piece. The effect is just unreal enough to allow space for the reality of the two migrants’ stories to function. To play upon the viewer’s mind. The same effect would be much harder to achieve with, for example, an actual video interview. One might assume that they were watching or listening to actors – there would be far too much space for the kind of dramatization which conceals true agony. In fact, it is arguable that as soon as you start to construct an overtly tragic narrative, you conceal the true reality or tragedy of a situation. What FF Gaiden: Delete does is precisely the opposite of this. Using only subtle aesthetic devices, it refrains from offering a definitive stance or suggesting what might be the ‘correct’ emotional response. This is what makes FF Gaiden: Delete so effective. It doesn’t deal with the horror of the migrant situation for the viewer; rather it forces us to imaginatively engage with the stories it tells in order to make sense of them. There is very little to tell us how we should feel or what we should think. Instead, we are obliged to develop our own emotional or practical orientation towards the painful reality, which is at least partially exposed by this film. FF Gaiden: Delete, Bury Art Museum and Sculpture Centre, 3rd February – 31st March 2018.